NEW ORLEANS — Five former winners of The Bowerman Award earned medals at the Rio Olympic Games and each triumph came with its own piece of history. Jenny Simpson (formerly Barringer), who hoisted the women’s trophy in 2009, became the first American woman — as well as the first woman from either of the America continents — to medal in the 1500 when she captured the bronze. It was also the first medal won by an American woman in a mid-distance event since 1988 when Kim Gallagher also took bronze in Seoul. Simpson fought through the pack on her final lap and unleashed a ferocious kick in the final 100 meters. The former Colorado Buffalo crossed the finish line in 4:10.53 and nearly caught runner-up Genzebe Dibaba of Ethiopia (4:10.27). Galen Rupp, the inaugural men’s winner of The Bowerman Award in 2009, waited until the final day of competition to win his second career Olympic medal. After a brave effort in the 10000 eight days earlier, Rupp doubled back in the marathon and looked strong throughout. Rupp cruised to a PR of 2:10:05 and nabbed the bronze medal. The former Oregon standout was the first American to medal in the marathon since 2004 (Meb Keflezighi) and third overall (two-time medalist Frank Shorter is the other) since 1924. From the marathon to the decathlon, Ashton Eaton cemented his status as The World’s Greatest Athlete with another gold-medal winning performance. Eaton, the 2010 men’s winner of The Bowerman Award, tied the Olympic record with 8893 points. Pushed by France’s Kevin Mayer (8834 points), Eaton never wavered in competition. Eaton is the third man to win back-to-back decathlon titles, joining Bob Mathias and Daley Thompson. The former Oregon Duck is the first to repeat as decathlon champ since Thompson did so in 1980 and 1984. Derek Drouin, who won the men’s trophy in 2013, joined the elite rank of two-time Olympic medalist. Drouin posted a clean sheet in last Tuesday’s final, not missing an attempt until he went for the Olympic record of 7 feet, 10½ inches (2.40m) with the gold medal already firmly in his grasp. With his gold in 2016 and bronze in 2012, Drouin is the fourth man in the history of the Olympic high jump to have won gold and another color medal at a previous Olympics. Then there is Brianna Rollins, the 2013 women’s winner of The Bowerman Award. Having been battle-tested at the U.S. 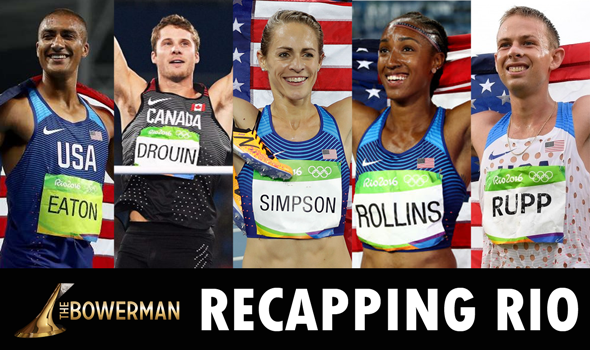 Trials, the rigors of the Olympic final were nothing for Rollins in the 100 hurdles. Rollins had a middle-of-the-pack reaction time, but her top-end speed left her competition in the dust. She broke the tape in 12.48 to not only win the gold, but lead an American sweep, the first in the history of the event. Since the inception of The Bowerman Award in 2009, six former winners have gone on to win Olympic medals. Three of them are now two-time medalists (Drouin, Eaton, Rupp), two others won their first medal in Rio (Rollins, Simpson) and the other (Deon Lendore) earned his in London.